View from my seats on Tuesday night. 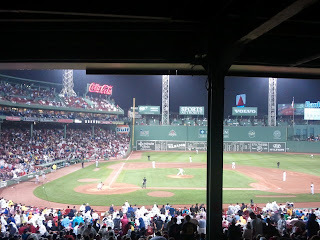 On Tuesday night I went to the Red Sox game. It's was raining so I was able to get good seats from a scalper for significantly less than face value; and they were even under the roof and protected from the weather. 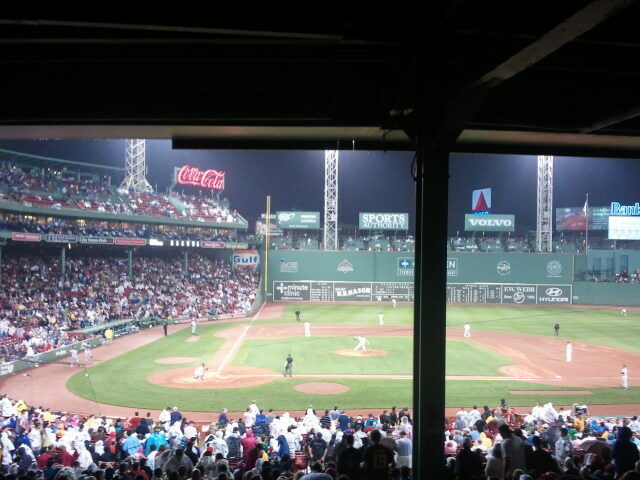 When the game was eventually stopped in the 6th inning, most people left right away. But those who stuck around were treated to better than normal rain delay entertainment; NBC's coverage of the Olympics broadcast on the giant screen in center field. It was pretty cool. The Sox begin a four game series with Minnesota tonight; they only have a few games left this year against bad teams, and this is one they need to take advantage of. Read my series preview at clnsradio.com. The annoying thing about watching "On Demand"